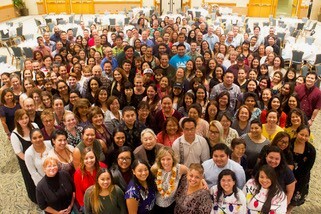 AlohaCare employees share a passion for helping Hawaii’s most underserved communities receive quality health care. Our employees find reward in helping others thrive. In addition to building a positive presence in the community, we offer generous benefits to our employees. Our passion is to serve the people of Hawaii in the true spirit of aloha by providing a comprehensive continuum of quality healthcare to all, with special expertise in caring for those who are medically underserved and/or medically fragile. This is accomplished with emphasis on prevention and primary care through community-governed health centers and in partnership with physicians and other healthcare providers that share our compassion and aloha for this population. At AlohaCare, employees look after one another. The AlohaCare Employee Committee program focuses on employee development and wellness. This staff-driven committee develops initiatives that boost morale and enhance our corporate culture. Employees in this career area have experience caring and interacting with members. They directly assist members with coordinating care and promoting health and wellness. In this career area of AlohaCare, employees work to keep day-to-day business up and running. These professionals work on both internal and external projects to promote AlohaCare as a business and in the community. Keeping track of our members requires a lot of paperwork and organization. The Employees in this area help to administer AlohaCare plan services to our members and providers. Last updated 4/8/2019 09:24 AM.